The celebrations include a selection of the highest calibre national and international children's theatre, music and dance shows as well as other arts events, including children's book readings, films, exhibitions, street performances and a multitude of hands-on arts workshops in a range of media for children and their families. RoolaBoola takes place annually over the bank holiday weekend at the end of October, and in 2015 runs from Friday 23 to Friday 30 October. 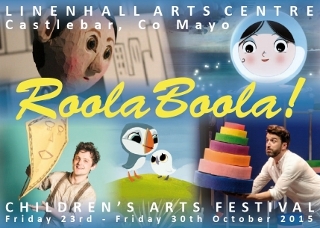 The brochure is available on the Linenhall Arts Centre website together with a lot of useful information for RoolaBoola Children's Arts Festival attenders. Click here for RoolaBoola Children's Arts Festival Archive.